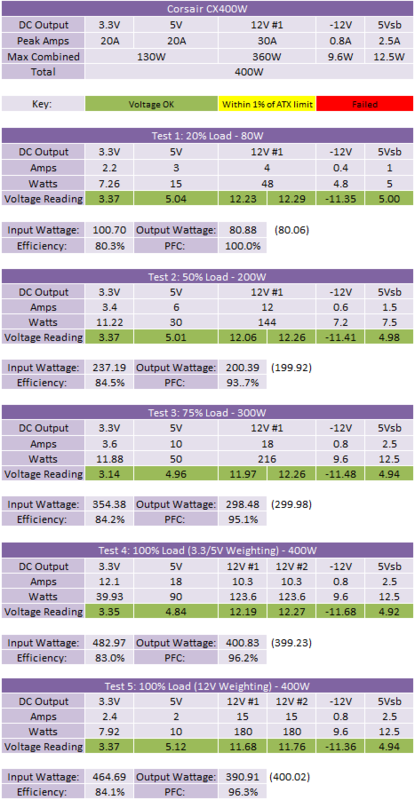 Corsair's CX400W generates a solid set of green results and pretty good efficiencies for a cost effective power supply. The majority of the efficiencies are into the 80Plus Bronze spec at around 84 percent, but the unit still complies with the 80Plus basic spec because its 20 percent load is a nose over 80 percent efficiency. At an 80W output, the difference between 80 and 84 percent is very small, so it doesn't make too much difference. Coupled with high PFCs, the overall sum is a solid product from Corsair which, considering the price, is a great result. The PSU is nice and quiet under normal load levels, albeit not silent, but the fan whips up quite considerably and it becomes noisy and intrusive to the environment at full load. Despite the audible hammering, the benefit of this is that internally we measured a very cool 30 to 40ºC temperature range topping out at 44ºC on the side behind the main power socket. Instead of being directly below the fan in the airflow deadspot, the main transformer actually gets some cooling now, unusually affording a similar temperature to the rest of the insides. To top it all off, Corsair's CX400W breezed through our 30 minute full load stress test as well.